PASADENA, Calif. -- NASA's car-sized Curiosity rover has begun monitoring space radiation during its 8-month trip from Earth to Mars. The research will aid in planning for future human missions to the Red Planet. Curiosity launched on Nov. 26 from Cape Canaveral, Fla., aboard the Mars Science Laboratory. The rover carries an instrument called the Radiation Assessment Detector (RAD) that monitors high-energy atomic and subatomic particles from the sun, distant supernovas and other sources. These particles constitute radiation that could be harmful to any microbes or astronauts in space or on Mars. The rover also will monitor radiation on the surface of Mars after its August 2012 landing. "RAD is serving as a proxy for an astronaut inside a spacecraft on the way to Mars," said Don Hassler, RAD's principal investigator from the Southwest Research Institute in Boulder, Colo. "The instrument is deep inside the spacecraft, the way an astronaut would be. Understanding the effects of the spacecraft on the radiation field will be valuable in designing craft for astronauts to travel to Mars." Previous monitoring of energetic-particle radiation in space has used instruments at or near the surface of various spacecraft. The RAD instrument is on the rover inside the spacecraft and shielded by other components of Mars Science Laboratory, including the aeroshell that will protect the rover during descent through the upper atmosphere of Mars. Spacecraft structures, while providing shielding, also can contribute to secondary particles generated when high-energy particles strike the spacecraft. In some circumstances, secondary particles could be more hazardous than primary ones. These first measurements mark the start of the science return from a mission that will use 10 instruments on Curiosity to assess whether Mars' Gale Crater could be or has been favorable for microbial life. "While Curiosity will not look for signs of life on Mars, what it might find could be a game-changer about the origin and evolution of life on Earth and elsewhere in the universe," said Doug McCuistion, director of the Mars Exploration Program at NASA Headquarters in Washington. "One thing is certain: The rover's discoveries will provide critical data that will impact human and robotic planning and research for decades." As of 9 a.m. PST (noon EST) on Dec. 14, the spacecraft will have traveled 31.9 million miles (51.3 million kilometers) of its 352-million-mile (567-million-kilometer) flight to Mars. The first trajectory correction maneuver during the trip is being planned for mid-January. Southwest Research Institute, together with Christian Albrechts University in Kiel, Germany, built RAD with funding from the Human Exploration and Operations Mission Directorate, NASA Headquarters, Washington, and Germany's national aerospace research center, Deutsches Zentrum für Luft- und Raumfahrt. 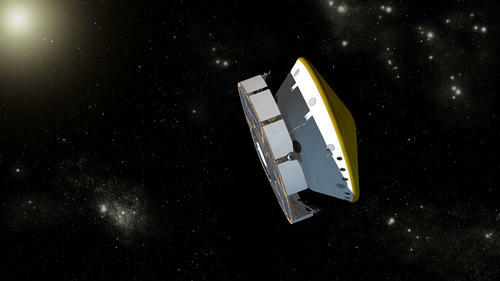 The mission is managed by NASA's Jet Propulsion Laboratory for the agency's Science Mission Directorate in Washington. The mission's rover was designed, developed and assembled at JPL, a division of the California Institute of Technology in Pasadena. Information about the mission is available at: http://www.nasa.gov/msl and at http://mars.jpl.nasa.gov/msl . You can follow the mission on Twitter at http://www.twitter.com/marscuriosity and on Facebook at: http://www.facebook.com/marscuriosity .